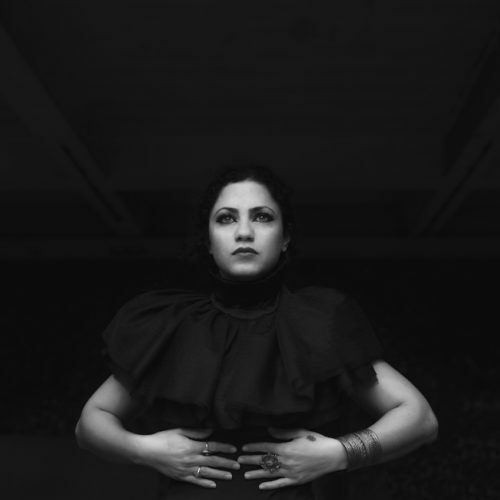 Partisan Records is excited to announce the signing of Emel Mathlouthi (Emel) and the release of her forthcoming sophomore album, Ensen, coming out February 24, 2017. On her sophomore album, Ensen, Emel distills her blend of acoustic and electronic sounds into a style that’s even more uniquely her own, citing Ben Frost, Samaris and James Blake as influences. With several producers, including Valgeir Sigurðsson (Sigur Ros, Feist) and her main collaborator French/Tunisian producer Amine Metani, Emel recorded the new album across seven countries and two continents. “We recorded acoustic takes of the songs, using a lot of North African drumming. Then we started creating our own library of organic beats running the percussions through our homemade effects and setups. They sounded like nothing we’d ever heard.” “Ensen Dhaif (Helpless Human),” the title track, is propelled by sparkling gumbri (a Tunisian three stringed big bass lute, used in Gnawa music), feverish zukra (Tunisian flute), trance inducing bendirs (North African frame drums) and heavy kick drum. Blessed with an exceptionally wide vocal range and expressive voice, Emel‘s impassioned live performances go far beyond the sounds on the album. “I never perform the same way twice. I am more of a show person than a studio artist; the songs have a second life once the recording is done. I’m very free with my vocals. My musicians adapt to any direction I want to take.” All confirmed dates below, and forthcoming US dates to be announced soon.